Customise and extend the SuiteCommerce platform using custom records and fields. Reach more customers on any device through responsive design. Eliminate the cost and time of development with SuiteCommerce reference applications and APIs. Access all the backend data such as, item catalogue, shopping history and recommendations, to deliver personalised shopping experiences. With SuiteCommerce, develop rich and engaging online experiences quickly and easily so you can continually innovate and adapt your ecommerce web site as fast as your business and customers demand with an ecommerce development platform. The SuiteCommerce platform provides two levels of ecommerce APIs: Commerce APIs and SuiteScript APIs. Commerce APIs provide the full functionality needed to build powerful and custom shopping experiences. 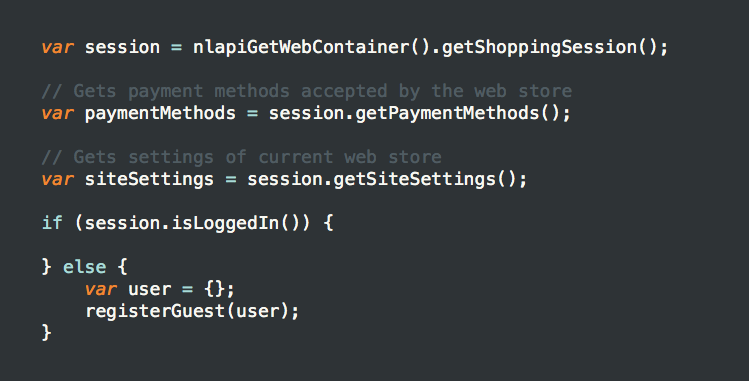 SuiteScript APIs provide lower-level functionality than the Commerce APIs. With SuiteScript APIs you can create, read, update and delete native NetSuite (i.e. Customer) records or custom records. The SuiteCommerce platform allows developers to build experiences using the latest technologies such HTML5 and CSS3. Our reference applications are built using a single-page architecture. By loading all the necessary resources on the initial page load, and then subsequently making Ajax calls to retrieve data, it eliminates page refreshes and lets you deliver great shopping experiences. You can choose existing single-page application frameworks, such as Backbone.js and AngularJS, or write your own. You can also use libraries such as jQuery, Require.js and Underscore.js to accelerate development.